50 lb bag Natural Nitrate of Soda prills are soluble, but may take a while to fully dissolve. Mix in a separate container with warm water and mechanical agitation. DO NOT add prills directly to spray tanks! Natural Nitrate of Soda is one of the only non-synthetic mineral sources of nitrogen; it is a naturally mined deposit that contains 16% nitrate nitrogen. This product is 95% natural nitrate of soda and 5% sulfate of potash homogenously mixed and then pelletized, yielding a 15-0-2 analysis. The extremely dry climate in Northern Chile allows for the concentration of nitrate originating from air and sea. It is a testimony of one of the important links in the natural nitrogen cycle. 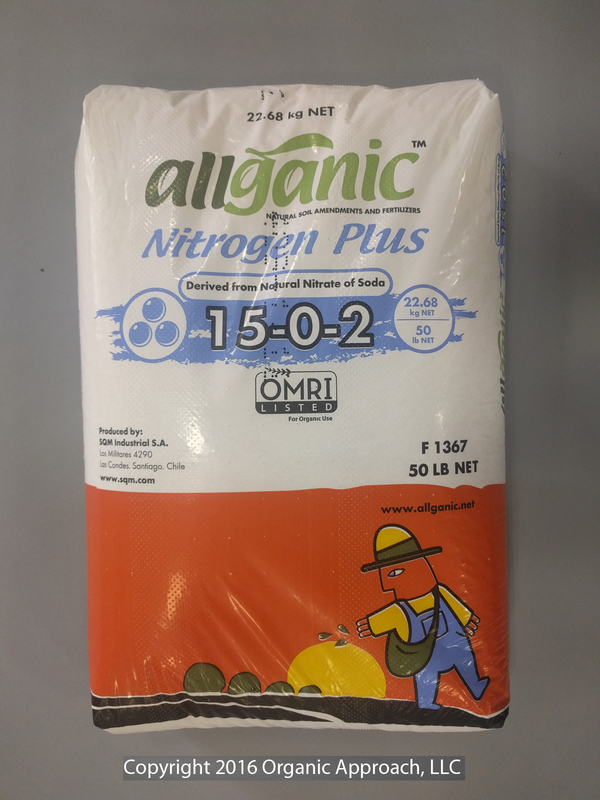 By providing Nitrogen that is available during critical plant growing stages and adverse weather conditions, nitrate of soda improves the nutritional quality of crops by increasing protein, albumin, amino acids, vitamin B, and micro-element content. Nitrate of soda also contains iodine and selenium, essential elements for human health.